H.E. Sheikh Hasina delivers her inaugural speech during the Opening Ceremony of the International Conference on Skills for the Future World of Work held in Osmani Memorial Auditorium in Dhaka, Bangladesh on July 27, 2017. 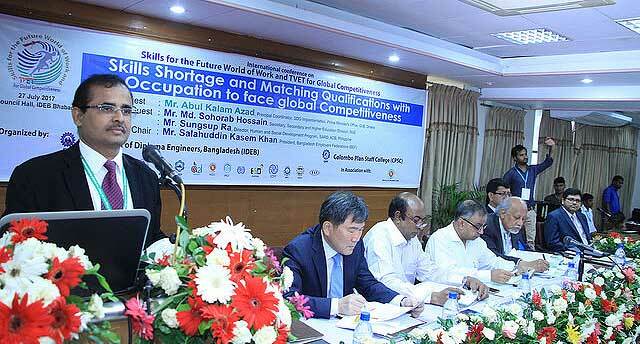 Her Excellency Sheikh Hasina, the Prime Minister of the People’s Republic of Bangladesh, inaugurated the International Conference on Skills for the Future World of Work, jointly organized by the Institute of Diploma Engineers (IDEB), Bangladesh, Department of Technical Education (DTE) and the Colombo Plan Staff College for Technician Education (CPSC). The conference was held from July 27-29, 2017 at the IDEB Headquarters in Dhaka, Bangladesh. A total of 2000 participants from all over the country and 23 foreign countries attended the event which was also graced by some of the highest officials in the country’s education sector including the Minister of Education, Mr. Nurul Islam Nahid; the Secretary of the Technical and Madrasah Education, Mr. Md. Alamgir; and the President of IDEB, Mr. AKMA Hamid. H.E. Sheikh Hasina called for the massive restructuring in the country’s education system and cited the need to further boost the technological capability of the labor force. She also mentioned the need for TVET to tap the huge workforce of Bangladesh and enable them to transform the economy into a highly-developed one by 2041. She also cited her government’s initiatives to further develop TVET in the country and to capitalize on the gains from globalization and international cooperation through modernization and ICT. She further expressed that this conference will motivate institutes across the country to fulfill her vision of a “Digitized Bangladesh” by 2021 by showcasing their innovative techniques and ideas into one forum. Dr. Ramhari Lamichhane, CPSC Director General, speaks in front of the 2000 guests during the Opening Ceremony of the International Conference. In response, Dr. Ramhari Lamichhane, CPSC Director General reiterated the organization’s commitment to put forward TVET development not only in Bangladesh but in the region as well. Speaking as one of the Chief Guests of the Program, he cited the need for economies to adopt the skills necessary to adopt to the demands of the 21st century. He also sent his warm wishes to the participants and the guests of the program and expressed his optimism that a productive endeavor will be achieved. The general objective of this conference envisages a TVET network that encourages the exchange of experiences, research findings and innovations among the participating countries including CPSC member states for mutual benefit and sustainable development. 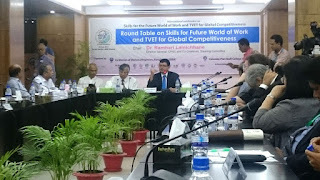 In addition to the 36 participants of the Regional Program on TVET for Global Competitiveness from the 12 CPSC Member Countries and experts from the different institutions and organizations in Bangladesh, some of the speakers invited in the event include representatives from the Asian Development Bank; Swinburne University, Australia; National Institute for Technical Teachers’ Training (NITTTR), India; Nord University, Norway; Nanyang Polytechnic, Singapore; SESRIC-OIC, Turkey, World Bank and the International Labor Organization. The paper presentations revolved around the six key areas namely: (1) TVET Governance and Capacity Building Strategies; (2) TVET for Global Competitiveness; (3) Research, Innovation and Pedagogy for Quality Assurance in TVET; (4) Socio-Economic Development through Repositioning TVET and Skills Development; (5) Quality Assurance in Technical Education and (6) Industry and Institution Linkage for Marching Qualifications and Occupation. Chief Guests during the Roundtable Discussion on the "Challenge and Potential of TVET for Prosperous World" held at the Le Meridien Hotel on July 27, 2017 Several roundtable deliberations were also held during the event. One of such is the discussion on the "Challenge and Potential of TVET for Prosperous World". This was held at the Le Meridien Hotel on July 27, 2017. Special guests at this event include: Dr. Ramhari, Mr. Hamid, Mr. Asaduzzman Khan, Honorable Minister, Ministry of Home Affairs; Mr. Md. Shahriar Alam, Honorable State Mnister, Ministry of Foreign Affairs and H.E. Ambassador Musa Kulaklikaya, Director General, SESRIC, Turkey. Another roundtable event tackled the need to establish a TVET that addresses the future world of work through Skills Development. This was held at the IDEB Headquarters in Dhaka and was chaired by Dr. Ramhari. Points tackled include some of the pressing issues of TVET in the region including the industry-institution linkages, improving TVET image, fostering international cooperation and other concerns from the industries, administrators and engineers. The “Dhaka Declaration 2017”, a synthesis of the findings and recommendations from the conference, was agreed to be adhered and implemented by the attendees of this roundtable discussion. Dr. Ramhari (center) chairs the Roundtable Event on Skills for Future World of Work and TVET for Global Competitiveness at the IDEB Headquarters on July 29, 2017. Another roundtable event tackled the need to establish a TVET that addresses the future world of work through Skills Development. This was held at the IDEB Headquarters in Dhaka and was chaired by Dr. Ramhari. Points tackled include some of the pressing issues of TVET in the region including the industry-institution linkages, improving TVET image, fostering international cooperation and other concerns from the industries, administrators and engineers. The “Dhaka Declaration 2017”, a synthesis of the findings and recommendations from the conference, was agreed to be adhered and implemented by the attendees of this roundtable discussion. The conference participants in front of the Bangladesh Parliament The participants also visited the Mohila Polytechnic Institute for a Cultural Ceremony and saw some of the sights in the capital including the Bangladeshi Parliament and the Bagabhandu National Museum in which they paid their respects to the founding leader of Bangladesh, Sheikh Mujibur Rahman. Dr. Ramhari delivers his closing speech during the Closing Ceremony and farewell Dinner at the Radisson Blu Hotel in Dhaka on July 29, 2017. The closing ceremony and farewell dinner was held at the Radisson Blu Dhaka Water Garden on July 29, 2017. 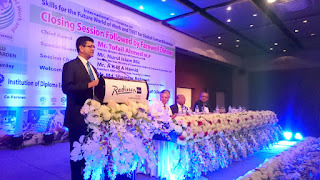 Chief guests who graced the event include Mr. Tofail Ahmed,M.P, Honorable Minister of the Ministry of Commerce and Mr. Nurul Islam BSc, Honorable Minister of the Ministry of Expatriates Welfare & Overseas Employment.